Approximately 20,000 spectators turned out for the 16th Annual Orange Plaza Car Show on April 18th, sponsored by Orange Sunrise Rotary. 430 classics, customs, hot rods and street rods rounded the “circle” and filled the Old Towne streets of Chapman, Glassell, Orange and Olive. 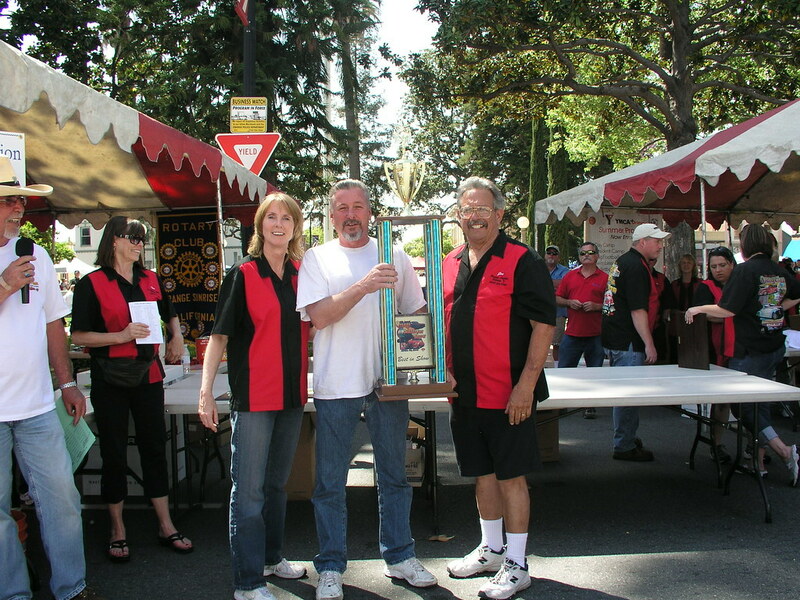 The car owners competed in 24 classes and several special division trophies were awarded. The crowd was entertained with classic rock spun by DJ Thumper and entered to win great prizes, such as a barbeque grill donated by Home Depot. Local merchants and restaurants supported the show, hosting a “Poker Walk” and providing food and drink specials to the capacity crowd. The Annual Orange Plaza Car Show is the primary fundraiser for Orange Sunrise Rotary, directly benefiting the YMCA of Orange and raising money needed for the club’s many charitable projects each year. Orange Sunrise Rotary partners with local organizations such as Rebuilding Together Orange County as well as with international organizations Corazon and Shelterbox to provide shelter for those in need. The club also funds many literacy and youth leadership projects, including the El Modena Interact service club on the high school campus. For photos of this year’s car show, visit our car show web page or see us on Flickr! This entry was posted in Club Service on April 26, 2010 by Rae.